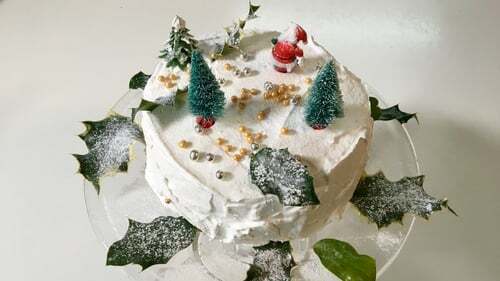 This White Christmas Cake with its layer of crisp frosting is a delicious alternative for those who do not like the traditional fruit cake. It is best made not more than a week before Christmas. Line the tin with grease proof paper. Cream the butter until very soft, sieve in the flour, salt and baking powder, then add the lemon juice, whiskey and ground almonds. Whisk the egg whites until quite stiff; add the castor sugar gradually and whisk again until stiff and smooth. Stir some of the egg white into the butter mixture and then carefully fold in the rest. Lastly, add the chopped peel and the halved cherries. Pour into the prepared tin and bake for 1 1/2 hours approx. Allow to cool, cover and ice the next day. To make the white frosting: This delicious icing is just a little tricky to make, so follow the instructions exactly. Quick and accurate decisions are necessary in judging when the icing is ready and then it must be used immediately. Dissolve the sugar carefully in water and boil for 1 1/2 minutes approx. until the syrup reaches the ‘thread stage’, 106-113°C/223-236°F. It will look thick and syrupy; when a metal spoon is dipped in, the last drops of syrup will form a thin thread. Pour this boiling syrup over the stiffly-beaten egg white, whisking all the time. Put the bowl in a saucepan over simmering water. Continue to whisk over the water until white and very thick. (This can take up to 10 minutes). Spread quickly over the cake with a palette knife. It sets very quickly at this stage, so speed is essential. Decorate with Christmas decorations or crystallized violets or rose petals and angelica. A Simply Delicious Christmas with Darina Allen and Rory O'Connell is on RTÉ Player now. Recipe taken from ‘A Simply Delicious Christmas’ published by Gill Books.